Biologists have long known that organisms from bacteria to humans use the 24 hour cycle of light and darkness to set their biological clocks. But exactly how these clocks are synchronized at the molecular level to perform the interactions within a population of cells that depend on the precise timing of circadian rhythms is less well understood. To better understand that process, biologists and bioengineers at UC San Diego created a model biological system consisting of glowing, blinking E. coli bacteria. This simple circadian system, the researchers report in the September 2 issue of Science, allowed them to study in detail how a population of cells synchronizes their biological clocks and enabled the researchers for the first time to describe this process mathematically. 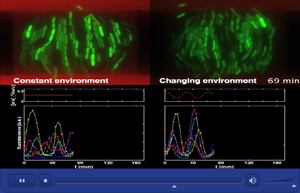 To study the process of entrainment at the genetic level, Hasty and his team of researchers at UC San Diego’s Biocircuits Institute combined techniques from synthetic biology, microfluidic technology and computational modeling to build a microfluidic chip with a series of chambers containing populations of E. coli bacteria. 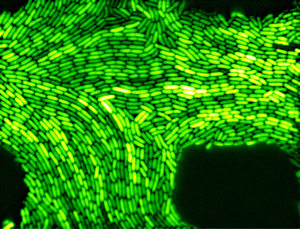 Within each bacterium, the genetic machinery responsible for the biological clock oscillations was tied to green fluorescent protein, which caused the bacteria to periodically fluoresce. Hasty said a similar microfluidic system in principal could be constructed with mammalian cells to study how human cells synchronize with light and darkness. Such genetic model systems would have important future applications since scientists have discovered that problems with the biological clock can result in many common medical problems from diabetes to sleep disorders. Other members of Hasty’s team included Lev Tsimring, associate director of the BioCircuits Institute, and bioengineering graduate students Octavio Mondragon, Tal Danino and Jangir Selimkhanov. Their research was supported by grants from the National Institute of General Medical Sciences and the San Diego Center for Systems Biology.